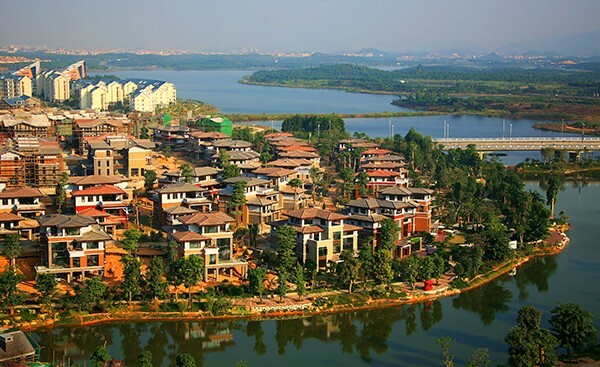 Located in the core area of the picturesque Songshan Lake Administrative Business District, Jinxiu Shanhe Phase III is hugged by the private Luqi Lake, Sandao Lake and Weilan Lake. Overlooking the azure Songshan Lake and embracing the luxuriantly green gardens, it has an advantageous location rarely seen in China. Apartment from a fascinating natural landscape, the project is surrounded by core resources of the city, adjacent to administrative business district, tourism resorts and municipal facility area and educational area. Thanks to the complete development planning and great importance attached to Songshan Lake by the government and its continuous rapid development, the project offers exceptional strengths in its connectivity with the Pearl River Dealt and Southeast Asia at large. Jinxiu Shanhe Phase III is composed of 50 detached houses and 5 high-rise residential buildings.